The actor: While Ricky Schroder has never been 100 percent comfortable with his child-actor past—he’s vacillated between using “Rick” and “Ricky” in his credits for years—he’s successfully maintained a 36-year acting career that’s kept people guessing. His first role, as T.J. in The Champ, was memorable for the classic scene in which he cries uncontrollably at the side of his boxer-father Billy (Jon Voight), who died during a bout at the end of the movie. From there, he moved onto the ’80s sitcom Silver Spoons, which Gen Xers still talk about, mainly because Ricky Stratton and his rich, immature dad rode a miniature train through their living room. But Schroder began to break out of that teen-idol image with a memorable role in Lonesome Dove, and shattered it as the troubled detective Danny Sorenson on NYPD Blue. In one of his latest projects, he co-stars with Luke Perry in an installment of Hallmark’s Goodnight For Justice series. Ricky Schroder: I got a call from the producers that said, “Hey, we want you to do this movie.” I read the script, and it was kind of a fun character. He’s a Civil War veteran who’s lost his mind, and he’s kind of psychotic and on the loose. Luke Perry really wanted me for the role, and I was kind of flattered. It’s nice when another actor really wants you to do something, and so I said yes. On set one day I said to Luke, “Why did you push so hard for me to do this?” Because he really pushed, and he said, “Ricky, my first job out in Hollywood was a job that you’d passed on. This is my way of saying thank you for that opportunity.” He never told me what that job was. If it was [Beverly Hills] 90210 I might have just clocked him, but I don’t know. The A.V. Club: In the latter part of your career, you’ve played a lot of guys who are not all emotionally or mentally there. What’s appealing to you about that kind of role? RS: Well, I have a real eclectic taste for work, for movies, for characters, and jobs. I don’t know, they’re just sometimes the most interesting guys in the movie. Sometimes you play the straight, heroic, leading man, and it is what it is: It’s straight, it’s heroic, and you’re the leading man. Where you get to sometimes show unusual colors to a character is in these other roles. They were maybe once honorable leading men, and then they sort of snapped and cracked. Now it makes them more complex and interesting to me. So I’ve played a few of these guys in the past, not many, but a couple of them, and I always seem to do really well in those roles. AVC: What is it about Westerns that you identify with? RS: Well, I grew up watching John Wayne with my grandpa, and I think as a young boy I was always fascinated by the West. It was so different from where I grew up in New York, and it’s a unique part of American history. It’s unique to America, this genre of movies and this settling of the West, and the American Indians being subjected to the horrors they were. It’s just an interesting time period, and throwing on the wardrobe, throwing the pistol on your hip, and getting on a horse just transports you back to a place, which is for me a really exciting and interesting and challenging part of America’s history to portray. At the same time, it’s really exciting because it’s so different from what we experience today. AVC: Was Lonesome Dove a way to start the adult phase of your career? RS: As I look back—I think it’s 36 years now since The Champ—it’s definitely one of the highlights of my memories of work in projects that I’m proud of. Lonesome Dove was the first Western I’d ever done, and being around those guys, [Robert] Duvall, Tommy Lee Jones, and Diane Lane—who I fell head over heels for—was really the highlight of my career up to that point. None of us knew that Lonesome Dove was going to blow up to become the piece of Western history it’s become. We all knew it was going to be a good project, I think, but we didn’t know it was going to explode like it did. People still talk about it 25 years later. I know people that have watched it so many times they wore their DVDs out. They just watched it constantly. RS: Well, it was just learning how to ride a horse and look good on it, be comfortable on a horse, and not be scared. You want to be able to have the confidence to ride fast, because you’re at risk when you ride fast. There’s a chance your horse will stumble or it’ll put its leg in a hole or something, and it takes some training to learn how to ride fast. I guess that was probably the most challenging thing: just getting comfortable on the horse, being around cattle, being able to move the cows where you wanted to, when you wanted to, and learning how to interface with these animals. Because I was a city boy and I’d never really done that kind of thing. So they sent us out there for a good three weeks before we started shooting, just to learn to ride, sleeping out under the stars and feeling what it would be like to be a cowboy in that era. We rode for three weeks and slept outside a few nights, and almost stepped on a couple of rattlesnakes. AVC: What did you learn from Robert Duvall, Tommy Lee Jones, and the rest of the cast? At that point, weren’t you 18 or 19 years old? RS: I turned 18 making Lonesome Dove. Duvall is still a friend of mine, so I talk to him all the time. One of the best parts about Lonesome Dove is having met him. What did I learn from them? Oh, goodness. I learned from Duvall that you should have fun doing this, because Bobby has a lot of fun when he works. He’s not brooding. He’s not sitting in the corner not communicating with people. He’s just full of life, and he sets the tone for the set as the leader in a sense because he just has a great energy about him. When you’re No. 1 on the call sheet like he was, there’s a certain responsibility that comes with that. You set the tone for the rest of the actors and the way the vibe and the energy is on the set. He was just a great leader. AVC: Did that help you move forward in your career to get past the child-actor stigma? RS: Oh, yes. That role coming off of Silver Spoons was a vital role as I look back on how people perceived me. If I had spent the next five years not working after Silver Spoons, I think things would have been very different for me than they are today. That role basically a year after Silver Spoons ended really helped people see me in a different way, as NYPD Blue [also] did. That was another transitional role for me. AVC: How daunting was it to come in and replace Jimmy Smits on that show? RS: I wasn’t even thinking about how hard it was going to be to replace Jimmy Smits. I was living on a ranch in Colorado raising kids at the time I got the job, and I fought really hard to get the part. When I got the part, basically they threw me into Manhattan with one of the exec producers, Bill Clark, who was a retired New York City detective, and they took me around for about eight days to all sorts of crime scenes and homicide scenes in the New York area, and they just immersed me into what it’s like to be a detective for 10 days. I know there were a lot of people that didn’t expect me to do well on that. 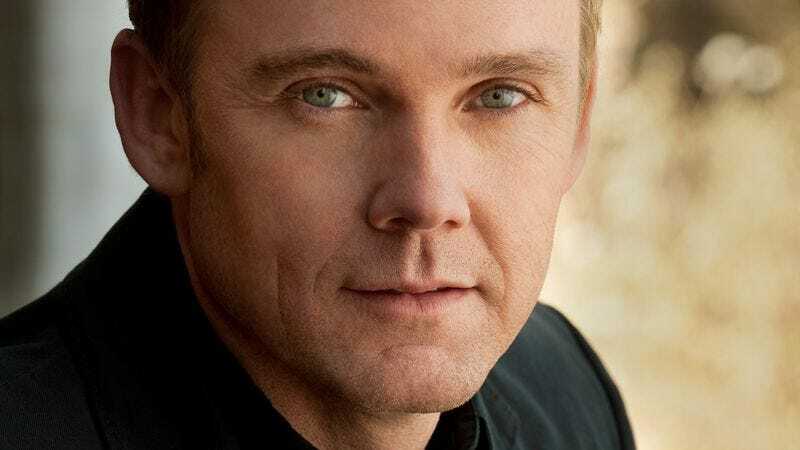 “How could Rick Schroder replace Jimmy Smits? They’re so different.” But I think Steven Bochco and David Milch were smart because they went with such a different kind of partner for [Dennis] Franz than Smits was. And I did some of the best work I’ve ever done on that show because it was some of the best writing I’ve ever worked with and best directors I’ve ever worked with. It did come to an abrupt end. There was a personal thing involved, so after three years it was time for me to go on, and it was nothing personal. It was [that] I had a loss, a death in the family, and I was just too grief-stricken at that time to work. So that’s how it ended. AVC: Were they okay with how they wrote you out? RS: I think they were. I mean, I think there was some sting involved, but I see Bochco and Milch now, and we hug and everything’s cool, so there’s no problem. AVC: Didn’t Danny die offscreen, and they just found him dead somewhere? RS: Danny was rolled up in a rug in a vacant lot. AVC: Did it seem like an ignominious ending for that character or did it seem fitting to you? RS: No, it didn’t seem totally appropriate or fitting to me, but I understand that they did it because they were looking out for themselves; they weren’t looking out for Danny Sorenson. AVC: Did you think it was ironic to be replaced by Mark-Paul Gosselaar? A lot of people put you two together because of the whole teenage-star thing? RS: I thought at the time that it was probably intentional that Bochco did that because he just wanted to make a point that I was replaceable. He made his point, but we’re very different people and very different actors. RS: Yeah. Bill Lawrence is a genius writer. When you’re working with a guy like Bill Lawrence, who is so smart and funny, you do what they say and you don’t question them. I was a male nurse, and that was the great part about it. He said it’s not what you’d expect me to come in as, but you got to trust when you work with people as smart Bill Lawrence or Steven Bochco or David Milch. You just go with it. AVC: You shot a few days in the original version of the Apt Pupil, correct? RS: Well, it was more than a few days. We shot, I think, about three-quarters of the movie, and then everybody and the crew’s check bounced, including mine, and we all realized the whole movie was being produced on no budget, on blue sky. AVC: According to an article in EW, by the time they got more money, you had changed so much in appearance that they couldn’t use you for the role anymore, even though it was only a year later. RS: Yeah. That was a time when I was really morphing. I think I was 16 or 17, and it was really a time when I was changing quickly. So yeah, they just couldn’t use the footage that had been shot, and I think my next big project was actually Lonesome Dove. It was supposed to be Apt Pupil, then Lonesome Dove ended up being the next project. AVC: You worked with a very young Brad Pitt in that movie. At the time did you think that he had the potential to become such a big star? RS: No way. You never think like that. I mean, at least I never have. Like, “Wow, that person [has] star written all over them.” There’s just such randomness to success in this industry. You can’t predict. He was a cool guy. He was like from Missouri or something. He was new in town, and he was good to work with, and totally focused and professional and friendly. Just a really good dude. AVC: How old were you when you shot this? AVC: At that age, how do you get worked up to that point when Jon Voight’s character is dead, and you’re sobbing so emotionally next to him? RS: You get into the moment, I guess. I never was trained as an actor or anything, and I think what happened when I was younger—and it probably even happens to me still sometimes when I’m working on really good project—is I sort of forget even though you know there’s cameras there and there’s a guy with a microphone standing there with a long pole. You forget about them, and you actually get so into the moment of what you’re doing that you suspend reality. It sort of disappears, and you really believe in the make-believe of what you’re doing. In that case, it was that my dad had died. And I think as I look on that scene and I look back on it and I watch it, that wasn’t acting. That was a little boy who is grieving his dad’s death. AVC: Is that easier to do when you’re 7 than when you’re 40? RS: Yes it is. It’s easier to do because you know kids’, especially the kind of kid I was, emotions are on their sleeve. You don’t have all those fears that adults have built up over the years, or layers of insecurity or whatever it is. Kids are just pretty raw and moldable, so it was probably a very special moment in time for me and for Jon. It’s a piece of film history. I mean, it’s really cool to be a part of something that’s going to live on beyond my life. I know the movie The Champ, especially the end, will live for a very long time. AVC: Most people barely remember anything they did when they were 7. Do you remember filming that movie, or are your memories formed from watching it? RS: No, I don’t have any real memories of it. I was young, I was 7, and I still talk to Jon every few months. We still keep in touch, but the actual making of it, it’s just as I sit and watch it, like you said. Sometimes it’ll seem like I’m close to it somehow. It’ll seem like things are working in my subconscious that I remember, that consciously I don’t. AVC: Like sounds, smells, and sights—things like that? RS: Yeah, like at the racetrack when you would hear the start of the race, or you would see the pink flamingos flying around the lake at the racetrack, or Jon when he slapped me in the prison and told me to get out of his life. Certain moments will jump out at me, like when I [saw] Jon slapping me in the prison, I choke up a little bit because even though I don’t quite remember it, I still feel the sting on my cheek. AVC: What made you decide to get into the sitcom business a few years after gaining attention with The Champ? RS: Well, I wasn’t in control of my career at that point. That was my parents, my manager, my agent; the people involved in my career made those decisions. I didn’t take the reins of my career until I was about 21, and I’ve been in charge since then. So I didn’t choose Silver Spoons. I think my mom and agent chose it because at that time there was a lack of patience on some of the people that were in charge of my career. I think there was a big offer on the table, and I think they took it. AVC: As you got older, were you feeling trapped by the role, or did you just embrace it and say, “This is a nice, regular job to have, with good pay”? RS: I never cared about money because I never needed money, you know what I mean? When I was 12 to 17 I never saw any of the money, so the money never motivated me. I had a really good time on the first three years of the show. I was 12, 13, 14, and then the fourth year was really tough, like 15, 16. I was going through awkward stuff and I was getting acne, and I was getting aware of girls and that was tough. Then the fifth year was great because I knew it was actually coming to an end and we all had fun. But yeah, there was a point toward the end where it became awkward because I was going through the awkward stages of puberty in front of everybody. It just was harder the older I got. AVC: Did it motivate you by that end to say, “I want to still act and take different roles, get away from this character”? RS: No, I mean, I wasn’t running away from him, from Silver Spoons, from Ricky Stratton, but I am thankful that Lonesome Dove came along, because if it hadn’t come along I’m not sure where my career would be today. I think Lonesome Dove was a hugely important transitional role for me. AVC: What was Jason Bateman like at that age? RS: Jason was so talented, and he was part of the show from the very beginning. He was in the pilot, and they liked him so much that he went on to get his own spinoff. Jason was my only friend in L.A. because I was from New York and didn’t know anybody. So Jason and I were buddies, and unfortunately our friendship never kept up over the years, but I’m really happy when I see Jason’s success. RS: There was a great project I’m really proud of called The Lost Battalion, which was a true story set in 1918, I think it was, in the Argonne Forest, and it was about a battalion in World War I that went through absolute hell for five days. I’m really proud of that film, and I’m also super proud of the film I just got to write, direct, and co-star in with my daughter called Our Wild Hearts, which just premièred on Hallmark Channel. I’m proud of that and proud of my daughter; she did a great job. AVC: How tough is it to work with your daughter? RS: Oh, it was great. She never played the daddy card. I treated her like any actor or actress on the set, and she was totally prepared. RS: I guess the last thing I would say is that I’m really proud of a project that is coming out on June 2. I created a reality show, believe it or not, for the United States Army called Starting Strong. I’m really proud of it. It’s a 30-minute reality show; it’s the Army equivalent of Dirty Jobs except this is Army jobs. So I got to work with the U.S. Army and [was] super impressed with the people I met in that organization. AVC: Do you see yourself directing and writing more as you go along? RS: Yeah. I got a couple of scripts right now that I’ve already written and I’ve got some interest in. I’ll direct them. And then I have a script I’m writing right now that’s a very timely script about an event that happened in Benghazi that I’m very excited to finish. AVC: Do you prefer having more control over projects these days? RS: Well, it doesn’t give me control because I still have to find somebody to fund it, but it gives me a creative outlet to put my energy into between those acting jobs that I want to do. Because there’s just not a lot of them out there that you want to do. It gives me another way to contribute, to use my talent.